The Thai Department of Trade Negotiations on 4th September held the second public hearing on the Comprehensive Progressive-Trans Pacific Partnership (CP-TPP), which the Thai government expressed interest to join in March this year. About 170 participants from local farmers associations, business sector, and women’s groups from Chiang Mai and surrounding provinces attended the meeting. The government heard many concerns raised by farmers and civil society organisations, including issues such as access to seeds and farmers’ livelihood. Vice Commerce Minister, Sakon Waranyawattana stated that the purpose of this public hearing is to collect opinions and concerns from stakeholders in various regions regarding the CP-TPP. As Thailand is still studying the opportunities and challenges of this trade agreement, one of the activities is to organise public hearing to gather the public opinion. The issues raised during the public hearings would be compiled along with other studies and shared with the government for decision-making process. Dr. Rachada Jiasakul, a representative from Bolliger & Company, a private consulting firm, made a presentation about opportunities and challenges of CP-TPP as a third-party impact assessment research provider. She also mentioned that Charoen Pokphand Group, or CP, is also another third-party researcher. It is not clear whether a government research on this issue was carried out or made available. The panelists of the public hearing disproportionately comprised of representatives from private sectors and government agencies while there no representative from civil society organisation were given the opportunity to present their views. “It is alarming to note that all the ‘impact assessments’ of CP-TPP have been conducted by large corporations, and it makes quite clear that for Thailand to join CP-TPP, only big businesses and corporations will benefit from this trade agreement. It will further corporate monopolies in agriculture and marginalise women, peasants and the majority of people. For this reason we, the women’s groups, labour rights groups, and civil society, reject the UPOV 1991 as well as the CP-TPP,” said Matcha Phorn-in, President of APWLD’s Thai Association. A great numbers of local farmers from Chiang Mai, Chiang Rai, Lamphun, and Lampang who attended the public hearings have repeatedly expressed concerns regarding farmers’ access to seeds and their rights to exchange and collect seeds for community use. Various farmers groups also raised concerns regarding dumping of agricultural products from other countries. In response, Thidakun Saen-udom, director of Plant Variety Protection Office, Department of Agriculture claimed that the farmers would still have the rights to collect seeds, as long as they are not under patent from seeds companies. Suluck Lamubol, APWLD’s Programme Officer said that the CP-TPP is all about amplifying the power of corporations to set trade rules that will negatively affect domestic policies to endorse corporate governance. “When questions were asked about people’s access to seeds, food sovereignty or access to medicine, the response from the government representatives were identical: as far as they are not patented everything will be okay. It is such a disrespectful and disguisive response when it is so clear that the CP-TPP is with strengthened intellectual property to put profit over people’s lives. CP-TPP is not about generating best welfare for the people as the government has come here and claimed,” said Suluck. Earlier in July, Thai government led by Deputy Prime Minister, Somkid Jatusriphitak committed Thailand to join CP-TPP following support from Japan, saying that CP-TPP will boost competitiveness for Thai entrepreneurs. Soon after, the Department of Trade Negotiations announced the public hearings in five provinces. Public hearings in Chonburi and Chiang Mai were recently completed and hearings in Songkhla, Bangkok, Khon Kaen are to take place on 13, 16, and 26 September respectively. 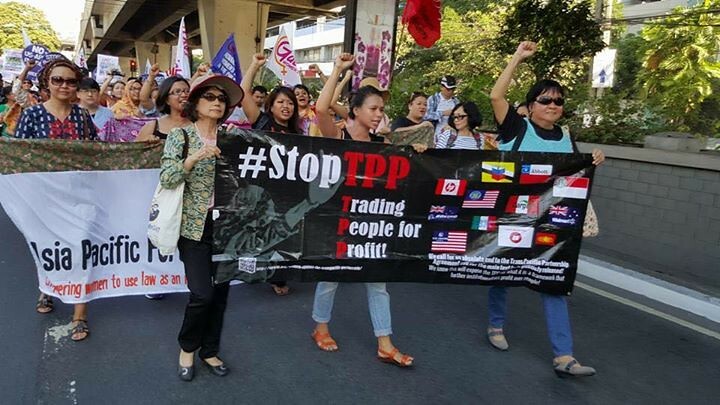 In March, Asia Pacific Forum on Women, Law and Development issued a statement, along with over 50 feminist allies from 10 of the 11 TPP countries, opposing this mega Free Trade Agreement as it would only put power and privilege in the hands of large multinational corporations and the wealthiest few. CP-TPP would require countries to treat foreign companies in the same way they treat local ones, pushing women, who are the majority of small scale, subsistence farmers to compete against huge agro-businesses. With the tightened intellectual property rights, it will prohibit seed sharing amongst farmers, impacting women who are the custodian of seeds, forcing them out of their farms and the local economy. APWLD will continue to monitor the scheduled public hearings and work with other social justice and people’s movements to stop Thailand from joining CP-TPP against people’s will.